So, while I wasn’t writing posts for the past month, there were lots of other things I wasn’t doing. I wasn’t cooking a lot at home. I wasn’t eating a lot at home. I wasn’t cleaning up a lot at home. I wasn’t taking a lot of photographs. I wasn’t sleeping very much. There were also a lot of other things I was doing. I was cooking a lot at work. I was making up new recipes, but I was a goof and didn’t photograph them. I was, as I said, working for the campaign. I was cooking for the campaign volunteers, though, once again, I forgot to take pictures. I was listening to a lot of NPR and reading a lot of news online. I was reading a lot of books. However, as gratifying as it was to work on a winning campaign, I have to say that the toll taken on our kitchen because of the not cleaning or cooking was very harsh. Our pantry closet had become a disaster area. I am certain that some of the food items that had fallen from the shelves onto the floor of the closet had started to fulminate into a spontaneously generated life form, and that once it had gained sufficient size and mass from eating dried pasta and sucking the life from forgotten onions, it was going to slither out from under the door and hunt our cats for sustenance. So, this Sunday, in the interest of nipping such a horrific domestic emergency in the bud, I set out to clean out and re-organize the pantry. Which I did, as you can see above. Now Zak can find Kat’s dried fruit snacks, the bread and the pasta without fearing for his life while I am at work, and I have a remote chance of being able to find any given ingredient I might wish to employ in the cooking of dinner now that I am less stressed out and busy. Once the pantry was cleaned, I noticed that the freezers looked a tad bit, uh, well, disastrous, so I cleaned those out today, took inventory and organized them. And I sort of organized the spice cabinet. I say sort-of, because it was really a half-hearted attempt at organization. My in-laws alphabetize their cupboards, so I know what real organization is like and I know, that no matter how hard I try, I cannot be that OCD about my cabinets. So, I bow to their superior organization skills and get on with life. But, you will notice, that for the benefit of Zak, I did take a marker and label the refrigerator shelves and drawers. I figure that if I change anything around, I can wipe the writing off with rubbing alcohol, and start over. The refrigerators, of course, are next on the list of my organizational frenzy. So why did I tell you all of that, you may wonder? So, I could talk a little bit about cooking from the pantry, which I think is the best way to go about getting a quick, nutritive meal on the table with the least amount of bother and fuss. 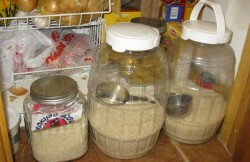 It is often very economical, because the point of having stuff in your pantry is that you can buy grains, meat, canned goods, condiments and spices when they are on sale in bulk, and then use them later if you have a decent sized pantry with a modicum of organization and a pretty good freezer. And with the economy as buggered up as it is at the moment, saving money is a great idea for everyone. What are some pantry staples that I keep around the house all the time that I can use to make a quick meal? Rice, obviously., and several kinds at that. I keep the ones I use most frequently–basmati, jasmine and sushi rice, in the glass or plastic bins pictured here. I buy them in large bags which I store in a closet down the hall, from which I portion out enough for each bin. When a bin gets empty, I pour the rest of the bag in, and so on and so on. Beans are a big one, both dried and canned. Canned are quicker than dried, but I like dried better, so I have some of each. And lentils–I have lots of dried lentils which cook faster than beans and taste just as good if not better. I have split peas, too. Pasta in every shape, made from every grain and from everywhere in the world they make noodles. Canned tomato products. Whole ones, diced ones, crushed ones, sauce, and paste, some or all of these are always around in my pantry, as well as a jar or so of salsa, either home-canned or from a local producer. Root cellar staples such as onions, potatoes, garlic, winter squash, sweet potatoes and carrots. Although I grew up with my Grandparents’ root cellar, I have yet to convert part of our underground basement/garage into one, so all of these save the carrots are stored in the bottom of my pantry closet behind the rice in bins. The carrots go in the crisper drawer. And in the freezer, I have all sorts of frozen vegetables, fruits, meats and fish, with a heavy emphasis on cheaper cuts of meat that are filled with flavor, like chuck or shoulder roasts, ground meats, sausages, farmed fish like tilapia and catfish, and bacon. Yeah, I have a huge store of food. It all comes from being a farm kid raised by two sets of grandparents who lived through the Great Depression and WWII. You don’t have to be as much of a food hoarder as I am to still turn out really great, simple, quick pantry meals. You just have to pick some basic ingredients you really like and that are really versatile, like beans, rice, pasta, canned tomatoes, olives, capers, anchovies, onions and garlic, and have some basic spices, and you are good to go. What kinds of stuff do I make with all of these things? Well, tonight, after digging around in the freezers and doing inventory, I was kind of tired, but I knew that I could make a really quick, tasty dinner of tacos just out of what I had in the kitchen. But we don’t use the little seasoning packets, so there. Nyah! 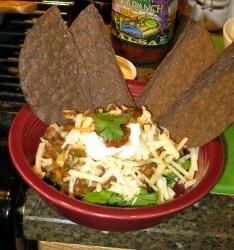 My ground meat tacos are easy, nutritious and tasty, and the leftovers can be put to many uses. You can turn the leftovers into burrito, quesadilla or omelet filling. 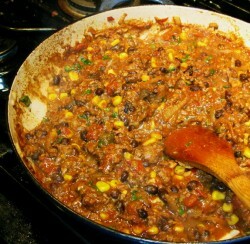 Or, you can add more tomato products, more chilies, and beans and turn it into chili. Or, you could make a pot of Spanish rice, grease up a casserole dish, put the rice in the bottom, the taco mixture on top, cover it with grated cheese and turn it into a casserole, which you can name after me, if you want. Or, you could make chipotle mashed potatoes, put the taco meat in the bottom of a casserole, the taters on top, sprinkle on some cheese and make Tex-Mex Cowboy Pie. Anyway, here is my recipe for taco filling–which, if you are a vegetarian, you can adapt by using a pound of refried beans in place of the meat. Heat olive oil in a heavy-bottomed pan over medium heat. Add onions and cook, stirring until they turn a medium translucent. Add sweet peppers and corn kernels and cook, stirring constantly until the onions turn medium golden brown and the corn is browned slightly. Stir in chopped cilantro, and scallions in any quantity you desire and use as a taco filling. I like to garnish it with lettuce, more cilantro, very sharp cheddar cheese, sour cream and really spicy salsa. I like to eat my tacos “inside out” because I make too much of a mess of my clothes if I pick them up and eat them the way normal people do. As you can see, I break my warm taco shells in half and after putting the filling and toppings in a bowl, stick the tortillas upright in the bowl. It looks kind of neat, and I eat it by scooping up the goodies with the taco bits. I end up with more food in my mouth and less down my cleavage, which is a great deal. Now, what can you add to this? Well, fresh or frozen chilies come to mind. I tend to make mine tame because of Kat–she likes spicy foods, but she isn’t really a chili-demon yet. We’re still working on that. Olives are nice in here–I like green ones better than black ones for this, though. With the olives, it tastes a little like Cuban picadillo. More and different kinds of beans are always possible. Pintos would be great! Fresh kale or collards, very thinly sliced and added near the end would be awesome. And since it is getting on to being greens weather, they would be perfect. And that is one of the best things about having a pantry full of ingredients–you can always remake your leftovers into something new and different, or customize a recipe into something even better than it was before. That’s because cooking from the pantry invites, nay, insists that the cook be creative. If you build up a stock of food and then vow to cook at least two or three meals a week from your pantry items, I guarantee you will come up with combinations you might never have thought of otherwise. Now, go digging around in your pantry and cook up something new and delicious–and as always–tell me about it! Wow – very cool organizing! I never make an inventory list, but I do organize my pantry every year at the end of the year, with an emphasis on figuring out what’s really old and how to use it up. I consolidate, throw away, cook little bits of almost used-up stuff, etc. It feels good at the end to see it all organized. Just last week I found rather old dense and tasteless pre-formed Mahi Mahi burgers. So I defrosted them, flaked them apart turned them into cilantro fish cakes and took them as an appetizer to a little dinner party. Everyone rave “oh these are so good” and I kept smiling thinking – yep and I am so happy they did not just end up in the trash when we were cleaning out the freezer last month. Thanks for all the focus on stocking and using a great pantry. It must be that time of year – I cleaned out my pantry this weekend too. I always replace my oils this time of year after hot summers. Some of my canned goods had expired sometime this year. They were put in bags and left in the alley instead of putting them in the dumpster. The alley faces the backend of a park. The bags were gone in 5 min. Next weekend I will attack the freezer/refrigerator. Good to have you back Barbara. I, too, have been busy organizing freezer and pantry. I need the room for my winter stores of squash, root veggies, and venison. Barbara, so good to “hear your voice” again. I miss my Athens days! I posted about a pantry mograbieh salad (well, the chicken was in the fridge rather than the pantry) for an Australian “pantry challenge” today. 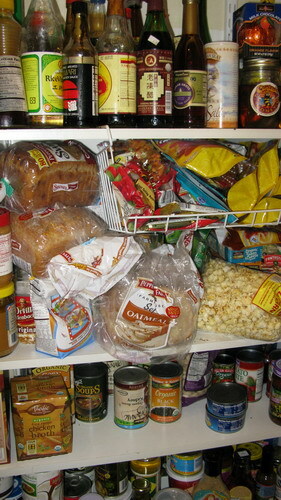 I find life much easier with a hoarder’s pantry.